Samokov (Bulgarian: Самоков) is a town in Sofia Province in the southwest of Bulgaria. It is situated in a basin between the mountains Rila and Vitosha, 55 kilometres from the capital Sofia. Due to the suitable winter sports conditions, Samokov, together with the nearby resort Borovets, is a major tourist centre. In the past, Samokov was a centre of handicrafts and art, with notable figures like Zahari Zograf, Hristo Dimitrov and Nikola Obrazopisov. The town's name is a compound word of "samo" and "kov", respectively meaning "self" and the root of the verb "forge, hammer", and comes from the samokov, a mechanical forge powered by water, since the town of Samokov was a major iron-producing centre during the Middle Ages. It is thought that Samokov was founded in the 14th century as a mining settlement with the assistance of "Saxon" miners. 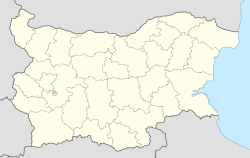 It was first mentioned in 1455 and in Ottoman registers of 1477 as Vlaychov Samokov. Some of the best craftsmen, woodcarving masters and builders came from Samokov and were recognized for their skills in creating detailed and impressive woodcarvings, painting beautiful icons and building unique architecture. In fact Samokov was one of the then famous three woodcarving schools in the region, the other two being Debar and Bansko. Their work can be seen in many churches and cultural buildings throughout the Balkan Peninsula. In the 16th and 17th centuries, it grew into the greatest iron extraction centre in the region, with western travellers describing it as 'a fairly large city'. In 1565–1566, Samokov had to produce and deliver to Belgrade 20,000 horseshoes and 30,000 nails. Samokov also produced anchors and other materials for the shipyards of the Bulgarian Black Sea Coast, particularly Pomorie. As the logging industry was also well developed, in 1573 the people of Samokov had to deliver 300 beams as far as Mecca. A large modern sports arena for basketball, volleyball, boxing, wrestling, judo and more was opened on 8 March 2008. Its cost is estimated to 16 million lev. There is also a skiing centre in Samokov for cross country skiing, a small alpine hill and a snowboard park. Bulgaria's only ski-jumping hill Chernia kos is located in Samokov. It is a fairly small hill, K-40 metres where you can jump down to 45 metres. The hill is very old and needs to be renovated. The local team is FC Rilski Sportist Samokov. Samokov has a humid continental climate (Köppen climate classification Dfb) with an average annual temperature of approximately 9 °C (48 °F). The altitude of 950 metres, in the skirts of Rila mountain, and the mitigating proximity to the continental mediterranean climate zone, are both strong factors in forming the climate. Summers vary from very warm, sunny and dry to warm and humid, while winters can be relatively mild and wet with lots of snowfall, but also colder and drier. Springs can be cool and wet, while in autumns there can be numerous sunny and warm days. Samokov Knoll on Livingston Island in the South Shetland Islands, Antarctica is named after Samokov. ^ "Untitled". Grao.bg. Retrieved 15 March 2015. ^ Karloukovski, Vassil. "Е. Грозданова, Ст. Андреев – Българите през XVI век – 4". Promacedonia.org. Retrieved 30 October 2012. ^ "Climatic data for selected stations Bulgarian (1961–1990., "Monthly Bulletin of NIMH")". Stringmeteo.com. Retrieved 21 February 2012. ^ "National Institute of Meteorology and Biology". Meteo.bg. Retrieved 30 October 2012. This page was last edited on 9 March 2019, at 12:36 (UTC).